"When Sweetback got away, there was a stunned silence. Then the place exploded." In the early 1970s, Hollywood was in bad shape. Blockbusters were getting bigger and more expensive even as their grosses were shrinking. Television was the preferred form of visual distraction, and movie attendance was dropping every year. Then along came Sweet Sweetback's BaadAsssss Song, the story of a violent black antihero hunted by racist white cops, and the surprise indie hit of 1971. Melvin Van Peebles' seminal film was a smash success, particularly among "urban" audiences, a market the studios were desperate to tap into. Van Peebles sat in the back of the theater during an early screening of the film, watching the audience react to the movie, one of the first to feature blacks as the protagonists rather than the supporting players or villains. He describes the old woman sitting in front of him begging "Let him die, don't let them kill him"�the fact that the character would die was never in doubt, because the black man always died in Hollywood movies. When, at the end, Sweet escaped his captors, the movie patrons were floored. "The place exploded," said Van Peebles. "Nobody could believe he had survived." Later that year, Warner Bros released Shaft, starring Richard Roundtree, and again black audiences flocked to the film, turning it too into a substantial money-maker. Soon, the studios realized the potential�spend a few dollars on a quickie film with a black cast, then sit back and watch the millions roll in. 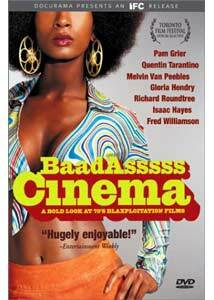 A new genre was born�films made and marketed to appeal to black audiences. Eventually labeled "Blaxploitation cinema," the films are widely considered to have saved Hollywood. But they make for troubling historical documents. Black audiences watched because they weren't used to seeing themselves play the heroes on film. All that was shown on television were the angry stereotypes�militant race rights protestors, rioters�and the Blaxploitation films took the stereotype and turned pimps, drug dealers, and vigilantes into heroes. On the one hand, films were more diverse than they'd ever been. On the other, they degraded the political needs of the black audience, simply contenting them with the fact that, for the first time, the black guy got away in the end. Filmmaker Isaac Julien's 2002 documentary BaadAsssss Cinema: A Bold Look at 70s Blaxploitation Films is an intelligent historical criticism of the much maligned genre, which has grown in infamy over the years. Julien pieces together interviews with some of the era's biggest stars, among them Van Peebles; Gloria Hendry (Black Caesar); Richard Roundtree; Fred Williamson (Hell Up in Harlem); and Pam Grier (Coffy, Foxy Brown); with insights from film scholars, from The New York Times critic Elvis Mitchell to feminist and social commentator Bell Hooks. As the stars and directors outline their participation in the frantic film business (Hendry made seven movies in four years), the critics offer historical perspective, analyzing what made the films popular and what that meant for the black film audience. Afeni Shakur, mother of the late rapper Tupac, calls the films empowering, their success a bold example of the power of black culture. While there certainly is a sort of rebellious undercurrent in many films of the genre (like Coffy, for example, in which star Grier guns down more than her share of sleazy rich white guys), the value of the genre as social criticism is in doubt. In hindsight, there was clearly a sort of collective consciousness at work, as so many filmmakers produced so many strikingly similar films. But, as Hooks points out, they were made to make money. "Academia and cultural criticism has come along afterwards to try to give this deep and profound spin to it," she says. "But let's face it. The foundation of why [these films] were made and why [they were] a success was all about money." BaadAsssss Cinema, originally produced for the Independent Film Channel, manages to cover both the historical and sociological evolution of the genre, and do it with lots of humor and plenty of vintage film clips. Modern icons like Samuel L. Jackson and Quentin Tarantino offer their own perspectives from time to time, and it is great to hear frontline stories from the stars of the era. With a running time of less than an hour, it feels somewhat truncated, but it's nevertheless an entertaining and informative summation of one of the most controversial of film genres. Image Transfer Review: As with any documentary, it's a bit difficult to put a grade on the image quality, simply because it is the nature of the form that archived materials are presented, in various levels of decay. The 1.66:1 letterboxed image is not anamorphically enhanced, but I doubt that makes much of a difference here. The newly filmed interviews look fine, with strong colors and a nice, crisp appearance. Older footage, be it from news broadcasts or films, varies from clip to clip. Overall, a nice presentation of fairly undemanding material. Audio Transfer Review: Audio is presented in a very basic stereo mix, with everything confined to the front soundstage. Speech is easy to understand, and the music sounds nice and solid. Not much to say about this one, except that it gets the job done. Extras Review: Aside from a nice trailer gallery featuring clips for a good chunk of the Docurama catalogue, this disc includes roughly half an hour of excised interview footage with some of the particularly noteworthy participants. Pam Grier talks about how she got started in the industry (4:19). Fred "The Hammer" Williamson waxes philosophical about the place of Black Cinema in Hollywood�and roundly insults Tarantino's Jackie Brown as a "poor replica" of the '70s Blaxploitation films (6:03). Gloria Hendry talks about being abandoned by Hollywood when the era of Black Cinema came to an end (11:04). Finally, Quentin Tarantino himself speaks about his love for the genre, and reveals himself to be an even bigger film geek than you've probably imagined (8:55).